This Storybook style fire station was designed by Julia Morgan, who is most famously known as the architect of Hearst Castle. It is situated in Montclair Village, a small neighborhood above Highway 13 in the Oakland Hills. Subsequent to the 1989 earthquake, the firehouse was closed due to needed retrofitting and remains closed today. Belongs in Hansel and Gretel, don't you think? Hans and Greta could live there I agree. That is the cutest firehouse I have ever seen!! me blue decoration is named "marquise"
Indeed, it belongs in Hansel and Gretel! «Louis» knows 'zackly where this is. He had no idea this is one of Julia Morgan's works. There is a brick building on the east side of Broadway below 40th now owned by Kaiser Hospital that is one of her works. Unfortunately, most of the nice detailing of her original design has been 'remodeled' out of the interior over the years. Hey, you've been up in my neck of the woods! Hope you checked out the library nearby, which is also storybook style. Must be the finest firehouse ever!! interesting you mention hansel and gretel as they supposedly put the witch in the oven. do we call the fire brigade? That is a glorious firehouse! I've never seen anything like that. A wonderful portrait. I love old buildings and am surprised this was still in use as late as 1989, looks too small for modern fire engines. Would make a very cool house, espcially if there was a pole inside. 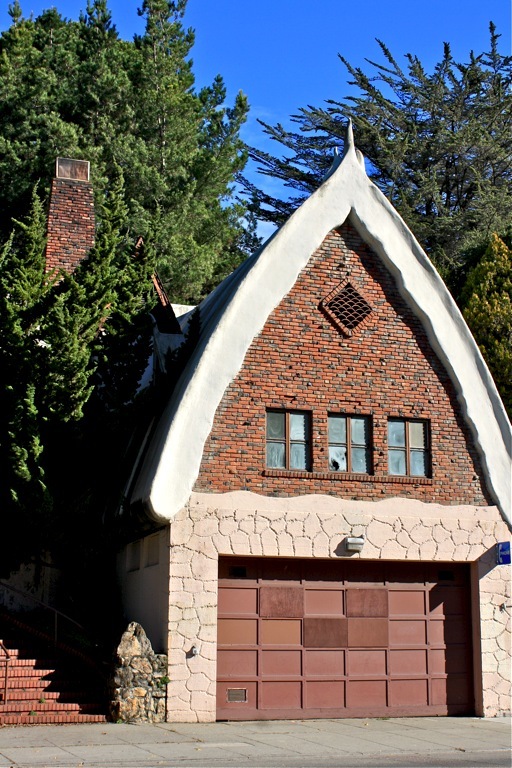 my family moved to the bay area in '58 when i was a kid; i was shown the famous montclair firehouse and it was love at first sight. still my favorite building. i especially liked morgan's ironic touch of shaping the frosting (roof) into stylized tongues of flame atop gable and dormer. This building was NOT designed by Julia Morgan. It is still a distinctive (although empty) building. Fire Dept left because it is on the Hayward Fault. I grew up in that neighborhood. The firemen would let us slide down the pole when we went there on tours. We had many storybook houses in the neighborhood - the library is still such a classic place. I believe the attributes to Julia Morgan are incorrect. Check the Friends of the Montclair Firehouse page to read more.